The FBI is at the New Jersey home of the sister of the Boston Marathon bombing suspects. The police director in West New York says the woman told authorities she has not been in frequent touch with her brothers. He says she is very upset. Police did not have her name. The woman, speaking through a crack in the door, tells The Star-Ledger of Newark her brothers are smart and great people. She says she doesn't know what got into them. She also tells the newspaper she is sorry for "all the people who are hurt." Russia condemns all "terrorists" regardless of their nationality, President Vladimir Putin's spokesman said on Friday after U.S. police shot dead a suspect in the Boston Marathon bombing who once lived in Russia. "They all deserve to be rejected," spokesman Dmitry Peskov said in the southern Russian city of Sochi, adding that the Russian authorities were waiting for official information from the United States on the dead man and a suspected accomplice. The uncle of a Boston Marathon bombing suspect is urging his nephew to turn himself in. Ruslan Tsarni of Maryland said Friday that 19-year-old Dzhozkar Tsarnaev should turn himself in to police and ask for forgiveness. He says the family is ashamed, adding that he loves the U.S. and respects this country. The uncle of the suspect called him "turn himself in, and ask for forgiveness" from the victims. Turkey's interior minister Muammer Guler says one of the suspects in the Boston Marathon bombing spent 10 days in Turkey 10 years ago but had no other links to the country. Guler said Friday that Tamerlan Tsarnaev had travelled to Turkey with a Kyrgyz passport, along with three other people with the same last name in July 2003. He said they entered Istanbul on July 9, 2003, and departed the country from Ankara 10 days later. Guler said Turkey has shared all information it has about the suspects with FBI officials. Tamerlan Tsarnaev, 26, was killed in a shootout in Boston. His brother Dzhokhar is on the run. Turkey, a Muslim country, has taken in hundreds of Chechens fleeing the conflict in Chechnya. Boston bombing suspect Dzhokhar Tsarnaev posted links to Islamic websites and others calling for Chechen independence on what appears to be his page on a Russian language social networking site. Abusive comments in Russian and English were flooding onto Tsarnaev's page on VK, a Russian-language social media site, on Friday after he was identified as a suspect in the bombing of the Boston marathon. Police launched a massive manhunt for Tsarnaev, 19, after killing his older brother Tamerlan Tsarnaev in a shootout overnight. On the site, the younger Tsarnaev identifies himself as a 2011 graduate of Cambridge Rindge and Latin School, a public school in Cambridge, Massachusetts. It says he went to primary school in Makhachkala, capital of Dagestan, a province in Russia that borders Chechnya, and lists his languages as English, Russian and Chechen. His "World view" is listed as "Islam" and his "Personal priority" is "career and money". He has posted links to videos of fighters in the Syrian civil war and to Islamic web pages with titles like "Salamworld, my religion is Islam" and "There is no God but Allah, let that ring out in our hearts". He also has links to pages calling for independence for Chechnya, a region of Russia that lost its bid for secession after two wars in the 1990s. The page also reveals a sense of humour, around his identity as a member of a minority from southern Russia's restive Caucasus, which includes Chechnya, Dagestan, Ingushetia and other predominately Muslim regions that have seen two decades of unrest since the fall of the Soviet Union. A video labelled "tormenting my brother" shows a man resembling his dead brother Tamerlan laughing and imitating the accents of different Caucasian ethnic groups. He has posted his own joke: "A car goes by with a Chechen, a Dagestani and an Ingush inside. Question: who is driving?" Elsewhere on the Internet, a photo essay entitled "Will box for passport" shows the older brother Tamerlan Tsarnaev practicing boxing at a gym. The captions identify him as a Chechen heavyweight boxer, in the United States for five years. "I don't have a single American friend," one caption quotes him as saying. "I don't understand them." At a news conference, Massachusetts Governor Deval Patrick said police are telling all residents in Boston and several surrounding communities to "shelter in place," meaning they should lock their doors and not open to anyone except properly identified law enforcement. Boston Police Commissioner Ed Davis warned the entire city of Boston to "shelter-in-place" on Friday as authorities pressed a manhunt for the second suspect in the Boston Marathon bombings. Police were searching for the man in the Boston suburb of Watertown. They said they were looking for the bombing suspect who was photographed wearing a white hat just before the Monday explosions that killed three people and wounded 176. Two Boston bomb suspects were named as brothers, Dzhokhar A. Tsarnaev, 19, and his brother Tamerlan Tsarnaev, 26, a US national security official said on Friday. The official said the older brother died in a shootout with police and the younger one was being sought in a house-to-house search for in the Boston suburb of Watertown. The brothers had been in the United States for several years, the official said. National security and law enforcement officials said they were leaning toward the theory that the bombings were motivated by Islamist extremism. Boston police said on Friday that all transit service by the Massachusetts Bay Transportation Authority "has been suspended until further notice" as a manhunt for a suspect in the bombing of the Boston Marathon was ongoing in a city suburb. Vehicle traffic was also suspended in and out of Watertown, Boston police said. Authorities say one of two suspects in the Boston Marathon bombing is dead and a massive manhunt is underway for another. 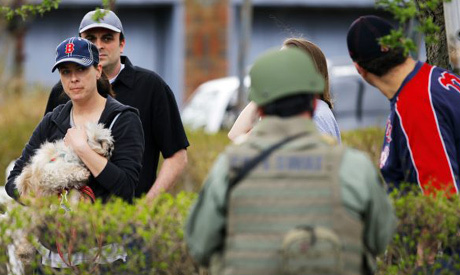 Residents of the Boston suburb of Watertown have been advised to keep their doors locked and not let anyone in. The Middlesex district attorney says the two men are suspected of killing an MIT police officer at the college late Thursday, then stealing a car at gunpoint and later releasing its driver unharmed. Hours earlier, police had released photos of the bombing suspects and asked for the public's help finding them. Authorities say the suspects threw explosives from the car as police followed it into Watertown. The suspects and police exchanged gunfire and one of the suspects was critically injured and later died. Police say the suspect on loose is a "terrorist" who "came here to kill people." Police in Watertown, Massachusetts, are looking for a suspect in the Boston Marathon bombing, officials said early on Friday. "We believe this to be a terrorist. We believe this to be a man who has come here to kill people. We need to get him in custody," said Boston Police Commissioner Edward Davis. The suspect police are looking for in Watertown is the one seen in images released by the FBI of a man wearing a white cap, Davis said. The Boston Marathon suspect who died had multiple wounds from gunshots and possibly the blast of an explosive, said a doctor at the hospital where the man was treated on Friday. The man arrived at the hospital in cardiac arrest, the doctor from Beth Israel Deaconess Medical Center in Boston told reporters. "There were signs of more than just gunshot wounds," said the doctor, who did not give his name. President Barack Obama was briefed by his top security and counter-terrorism advisers on developments in the Boston bombing manhunt and investigation for about an hour in the White House Situation Room on Friday, the White House said. The briefing ended just shortly after 10:45 a.m. EDT (1445 GMT), the White House said.